Jesus said in Matthew 7:15, "Watch out for false prophets. They come in sheep's clothing, but inwardly they are ferocious wolves." 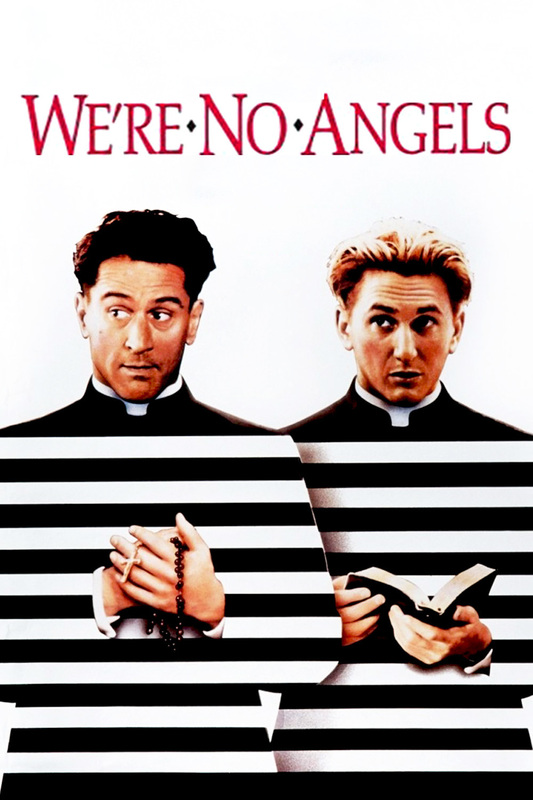 Now admittedly, Robert De Niro and Sean Penn as the escaped cons disguised as priests might not be wolves (they're more like lhasa apsos), but you'd hope the monks that welcomed them into their monastery would have been a little more discerning. 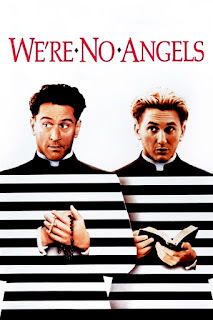 We're No Angels, directed by Neil Jordan (of The Crying Game and one of my favorite werewolf films, The Company of Wolves) and written by David Mamet (Glengarry Glen Ross and The Untouchables), is a darkish comedy set during the Great Depression. As usual, we're reviewing the religious institution in the film, in this case The Weeping Madonna Monastery, rather than the film itself. But the film opens in a different institution, a U.S. penitentiary near the Canadian border. A man, Bobby, is about to be executed, and two convicts --Ned and Jim (De Niro and Penn) -- are brought in to be witnesses. A priest is also brought in to hear Bobby's confession, but Bobby scoffs. Turns out, Bobby's got a gun. He escapes, taking Ned and Jim along. Bobby kicks the priest on the way out, which is better than the bullets a couple of the guards get. 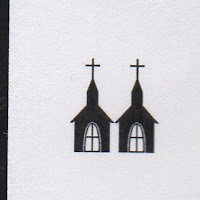 Ned and Jim find themselves wandering a country road where they notice a sign for the Weeping Madonna that features Hebrews 13: 2 ("Do not forget to show hospitality to strangers, for by so doing some have shown hospitality to angels without knowing it" -- thus the title). They meet a woman who, for some inexplicable reason, mistakes them for priests from the monastery. Jim quotes the verse from Hebrews, which confirms her ungrounded suspicion. When they meet the Father who runs the monastery, he assumes Jim and Ned are the priests from Arizona the monastery has been expecting: Fathers Brown and Riley, who together wrote the book A New Look at Revelations and are considered "two of the finest thinkers in the world." It's swell that this monk and others apparently value learning, but when they fail to realize these two dim bulbs aren't who they thought, one assumes they would have celebrated the Emperor's New Clothes as well. When the convicts join the monks for dinner, Jim (now called Father Brown) is asked to say grace. He basically says, "Be nice to people" for grace; a swell sentiment, but the prayer should have been a clue to the other monks and priests that he wasn't really a priest. Maybe if he'd prayed, "Rub-a-dub-dub, thanks for the grub" they might have caught on. A young monk approaches Jim and asks him to explain something in his book to him. The monk (an early role for John C. Reilly) refers to a verse, 10:19, without saying what book of the Bible it's from (it's Deuteronomy). He asks if, in the book, they were going for a Gnostic meaning in the verse and Jim says, sure that's it. I have real problems here, since half of the New Testament epistles take time to condemn Gnostic teaching (sorry Dan Brown, Gnosticism stinks). The convicts want to cross the border into Canada. Every year, the monks of the Weeping Madonna Monastery have a procession, taking the statue to a sister church in Canada. Ned and Jim see this as their opportunity to escape. However, the monks must take a sick person with them as part of the procession. They take a young deaf girl, the daughter of a local prostitute (Demi Moore). Spoiler -- eventually a miracle ensues. Before the procession, a monk or priest is chosen by lottery to give a sermon. Jim wins the lottery. He doesn't know what to say, so he uses a flyer selling a Colt revolver as his starting point. He eventually says that God may be all in your head, and he doesn't know whether God is good or not, but if it comforts you to believe in God, do it. For some reason, this gets a big ovation from the crowd, and the priests and monks love it. I don't think the Apostle Paul would have been so thrilled. He cared about truth. He wrote that if Jesus was not raised from the dead, our faith is pointless. The monastery is named after a statue on Mary on the grounds that occasionally seems to cry. The priest who runs the place knows that there's a hole in the roof that drips on the statue, making it look all sad at times. The clergy at the monastery seem to think that it's better for the little people to have something to believe in, even if it's not true. I think God values truth much more than the clergy in this film do. God is pretty big on truth. Jesus called himself "the Truth." 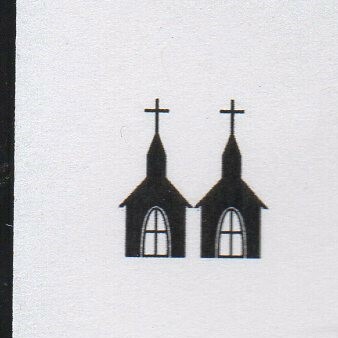 But the clergy at the Weeping Madonna Monastery are not particularly concerned about truth, which is why they earn just two steeples.